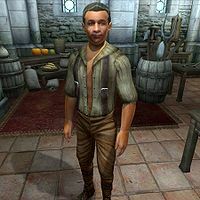 Sergius Verus is an Imperial trader who lives and works with his two brothers, Cicero and Tertullian, at Three Brothers Trade Goods in the Market District of the Imperial City. Sergius sells general goods, upgrades for the Imperial City house, and the unique sword Akaviri Sunderblade, which cannot be found anywhere else. The store name indicates that all three brothers work there, but that is not entirely true. Only Sergius and Tertullian offer services, while Cicero works for The Black Horse Courier next door. The three of them sleep in the living quarters above the shop every night between midnight and 6am. After waking up, they share a two-hour breakfast in the main trading room before going their separate ways. At 8am on every day except Sundas, Sergius unlocks the door to the shop and spends the next twelve hours offering his services to customers. He takes Sundas off, pacing the plaza outside his store until midday before heading to the Arboretum where he strolls around the statues and flower beds until 8pm. At 8pm during the week (Morndas to Fredas) he heads to The Feed Bag for dinner, and spends four hours with his fellow merchants and traders. Loredas sees him heading to the Temple of the One instead, and on his day off, Sundas, he heads to Green Emperor Way where he spends the evening enjoying the company of his secret admirer. He wears casual middle-class attire: a shirt with suspenders, a pair of tan linens and quilted shoes. He carries around the shop key and a large sum of gold. As most citizens can't tell the brothers apart, he will always introduce himself like this: "Tertullian, Sergius, and Cicero... the Three Verus Brothers. I'm Sergius." When asked about the Imperial City, he will give you a bit of background information on their neighbors: "The Black Horse Courier is run by three Khajiit brothers. They buy freelance stories with an Imperial stipend, and give the papers away for free." The citizens of the Imperial City often talk about Sergius' brothers and their store. Some people can be heard asking: "Don't the Verus brothers run a good shop?" and "Have you ever browsed the goods at Three Brothers Trade Goods?" to which others will respond: "Cicero, Sergius, and Tertullian run a good shop." or "I've shopped there many times. The brothers never fail to please." You may also hear other citizens talking about how they can't figure out which brother is which: "Three Brothers have some good merchandise. Don't know if I've met all three brothers, though." and "I shopped at Three Brothers a couple of days ago. Not sure which one I talked to, though. ", causing others to respond in agreement: "All three of them are nice folks." and " I don't know which is which. Still, it's a good shop they run." Sergius was intended to play a role in the unfinished "Imperial Couriers" quest; at midday on the 12th of each month, as long as Erina Jeranus is still alive, he will head to the Black Horse Courier office in the Market District and spend a brief amount of time there, before taking a stroll between the Green Emperor Way and The Elven Gardens District. He will return to the Market District at 4pm. Esta página foi modificada pela última vez à(s) 19h44min de 21 de maio de 2015.